PCnizi gereksiz ve geçici dosyalardan arındırın, değerli sabit disk alanınızı boşaltın ve sisteminizi hızlandırın. 1. Kaşe, çöp, geçici dosyalar ve çerezleri 50den fazla tarayıcıda temizleyin. 2. Bilgisayarınızdaki tüm gereksiz dosyaları ve log dosyalarını bulun. 4. Hafıza doluluğunu bulur ve temizler. 5. Küçük öngörüntüleri kaşesini, font kaşesi ve ikon kaşesini temizleyin. 6. Chkdsk File Fragments, son dokümanları ve Windows hata alarmlarını temizleyin. 7. Eski işletim sistemine ait dosyaları silin. 8. Windows arama kaşesini temizleyin. 9. GPU cache klasörlerini temizleyin. Licens bilgisi: 1 bilgisayar/ 1 yıllık lisans. 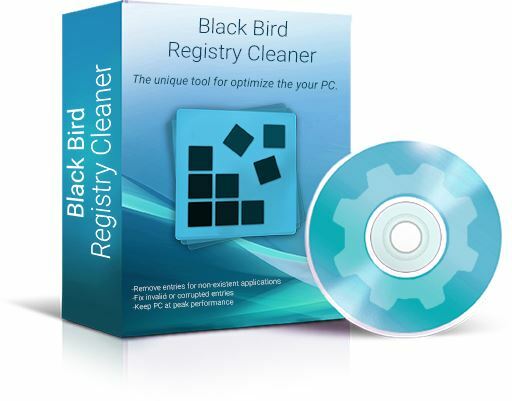 Keep your PC at peak performance with Black Bird Registry Cleaner! Once your Registry has been cleaned up, you will notice a performance boost. The Registry Cleaner will remove entries for non-existent applications, and it'll also fix invalid or corrupted entries. Your computer knows almost everything about you! And what do YOU know about your machine? 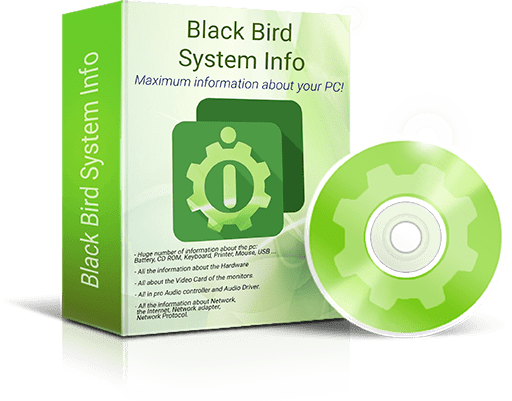 Get the Black Bird System Info and find out the maximum information about your PC! Full information about your PC's Battery, CD ROM, Keyboard, Printer, Mouse, USB, Hardware and Processo- Entire information; about your Hardware and ProcessorVideo Card, Network, the Internet, Network adapter, Network Protocols, Motherboard, Memory and BIOS etc. 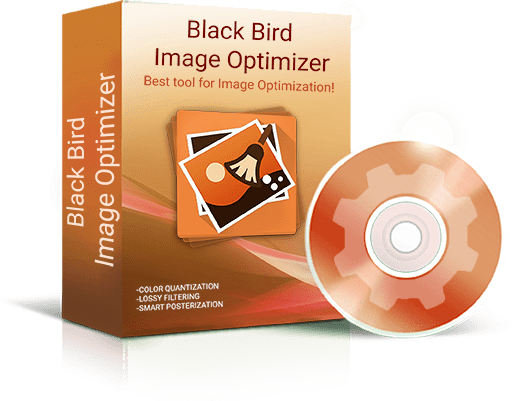 I tried Blackbird Cleaner last ti,me, it was given away, and it was far too aggressive and removed both system files, program uninstallers, and as a user, I had very limited chances to see or set the cleaner. Fortunately, I had a system backup, which saved the crippled OS. Thanks for the offer but no thanks today. I'm too scared to use it after hearing Alan's comment. I am trying to get my system operating correctly after using this 'Cleaner'. Need to be very careful with this one. As mentioned. I am trying to get my system operating correctly after using this 'Cleaner'. Need to be very careful with this one. Often cleaner software will overdo things; just to prove their "usefulness". You may damage your PC unknowingly. Newbies unknowingly "clean" the DAT and LOG files to reclaim a paltry & insignificant amount of hard disk space. Many software require unins000.dat or install.log files before they are able to be uninstalled. If you had "cleaned" them, you CANNOT uninstall those software. One more thing - the software write up mentions cleaning "unnecessary" files. What if your definition of "unnecessary"? What is unnecessary to Mr X --- is very necessary to Mr Y. Do NOT use. Often cleaner software will overdo things; just to prove their "usefulness". You may damage your PC unknowingly. Newbies unknowingly "clean" the DAT and LOG files to reclaim a paltry & insignificant amount of hard disk space. Many software require unins000.dat or install.log files before they are able to be uninstalled. If you had "cleaned" them, you CANNOT uninstall those software. One more thing - the software write up mentions cleaning "unnecessary" files. What if your definition of "unnecessary"? What is unnecessary to Mr X --- is very necessary to Mr Y.